Wonton cups with crab salad (pictured, above) – brush wonton wrappers with a little oil, stick into a mini-muffin tin and bake till golden. Let them cool, then fill with a crab salad of your choosing. I use fresh crab, mango, red chilli, coriander and Vietnamese mint lightly dressed with a mix of fish sauce, palm sugar and lime juice. 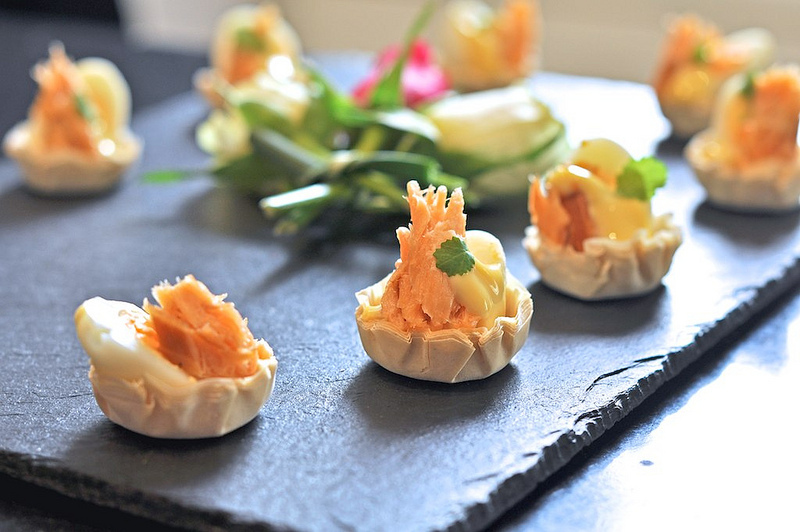 Hot smoked salmon and hollandaise filo cups – brush small squares of filo pastry and stick into a mini-muffin tin and bake till golden. Let cool, then fill with hot smoked salmon (the smoking process is hot, not the actual smoked salmon! ), and drizzle some hollandaise over the top. You can either buy the hollandaise, make it in a saucepan or, if you have a trusty Thermomix, whip up a perfect batch in four minutes! 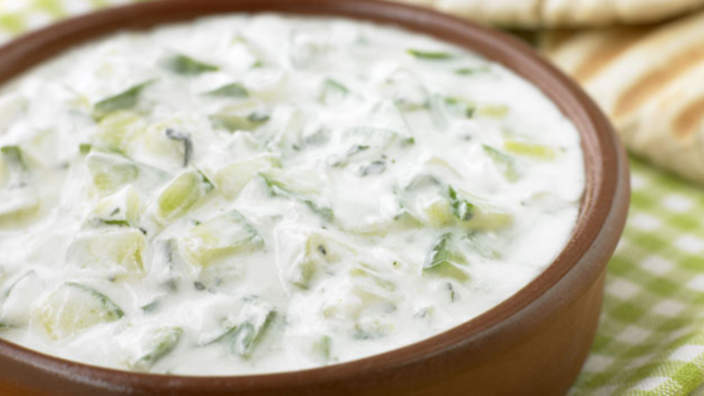 Tzatziki – honestly the easiest dip in the world. Take a tub of Greek yoghurt, grate some cucumber (squeezing out the excess moisture on a paper towel), add two cloves of crushed garlic and a bit of chopped mint (optional). I just mix everything in the yoghurt container, pop the lid back on and into the fridge until it’s time to serve. Serve with zucchini, capsicum, and carrot sticks. 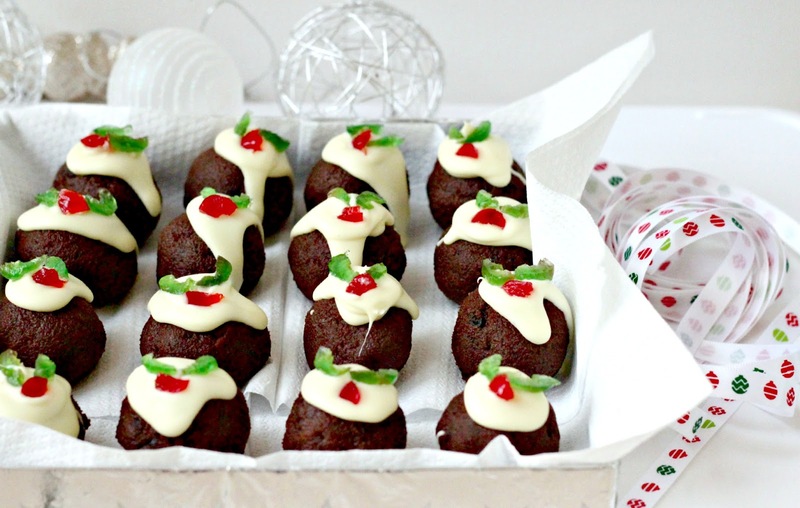 Chocolate pudding truffles – take a Christmas pudding (a generic brand will do), add in some icing sugar, melted chocolate, a bit of coconut (and anything else you might like) and some additional brandy to taste. Smoosh it all together, then take about half a tablespoon and roll into a ball. Leave to set in the fridge (these can be made the day before) and then drizzle some melted white chocolate over the top to serve as “custard” before decorating with little fondant holly leaves and berries or some chopped pieces of red and green glace cherry. See part 1 of Tara’s catering genius, Catering to a Christmas crowd, here. Do you have a favourite easy finger food at this time of year? Hey Tara ! Your recipe is amazing ! I love the bright colors of food and I am sure they taste as good too.